Every month the magazine provides German learners with interesting texts on current topics about life in Germany, Austria and Switzerland. The audio trainer and the workbook help you to improve your German skills even more. 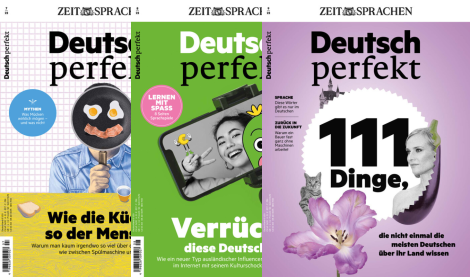 Each month, with every new issue, Deutsch perfekt magazine provides material for learning German successfully: useful articles, practical tips for living in Germany and interesting interviews – but also explanations and exercises on German vocabulary and grammar. In each issue of Deutsch perfekt you will find explanations for around 750 words, expressions and idioms. The words are described in simple German and the explanations correspond to the language level used in the text. They are conveniently located next to the articles. The explanations also include word stress, the plural form as well as regional or country-specific differences. The word explanations are great for improving your reading comprehension as well as also your vocabulary. More than 20 editors, writers and correspondents are constantly on the lookout for topics that are best suited for Deutsch perfekt. The magazine offers a versatile mix of short articles and longer news stories, interesting interviews and controversial discussions, travel recommendations and practical tips for work, university and everyday conversations. Economics, career, politics, culture, entertainment, sports, tourism and everyday life in Germany – not forgetting Austria and Switzerland – are all featured in Deutsch perfekt. As often as possible, the magazine focuses on people: On celebrities and experts as well as “regular” people who have something special to say about a particular topic. All of the Deutsch perfekt issues also cover topics from a foreigner’s perspective, looking at Germany “from the outside”. Deutsch perfekt helps you to better understand what is important in Germany, Austria and Switzerland, the locals’ wishes, fears and dreams, and what they are talking about. Each month German learners find explanations and exercises on grammar, vocabulary, style and idioms as well as other German language phenomena on the approx. 15 pages of Deutsch perfekt magazine. The exercises correspond to the content of the texts, and there are German dialogues, sample texts, vocabulary lists and language puzzles for the readers to discover. On the flash cards you will find important linguistic details such as vocabulary and idioms. They offer tips and examples for better communicating in everyday life and on the job. The content of the cards is summed up in a compact format, which makes them easy to archive. You will find even more exercises in Deutsch perfekt Plus. It is a great tool for in-depth practice of the vocabulary and grammar featured in the magazine. Each month additional exercises help to improve your spelling as well as your reading and listening comprehension. Would you like to practice your listening comprehension and improve your pronunciation? Deutsch perfekt Audio makes it possible. Take advantage of over an hour of German listening practice with audio texts, dialogues and exercises on CD or to download. Many of the tracks correspond to the content of the magazine, and there is a focus topic with exercises for different language levels featured each month. In addition to listening comprehension and pronunciation, Deutsch perfekt Audio also includes content to practice vocabulary, grammar and phonetics. 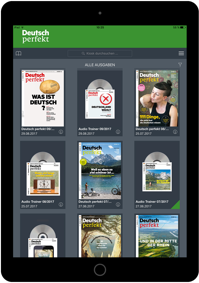 Improve your German skills on the go: The Deutsch perfekt app combines the magazine and the audio trainer in an app for effortless learning. Our website provides a selection of texts, exercises and audio samples from the Deutsch perfekt products. We are also offering additional content for learning German. The vocabulary trainer that lets you save individual words and practice them – like using flash cards – is one of the special features. Who is behind Deutsch perfekt? Their expertise is a valuable asset to ensure accurate research and high-quality texts. 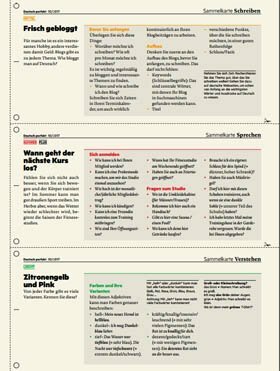 A further team of editorial employees creates around 750 word explanations (German-German) and translations into seven languages (for a special section) each month. In addition, specialist writers are in charge of the magazine supplements Deutsch perfekt Plus (for intensive learners) and Deutsch perfekt im Unterricht (for teachers and instructors). Our editorial team also includes experts in the fields of photo editing, design/layout, illustration, production, internet and recording studio. Who are the readers of Deutsch perfekt? Readers from over 100 countries enjoy Deutsch perfekt. To all of them the German language is important. To many of them because they are learning German and they love the language. Some of them love someone who speaks German. Or they are learning the language for work and want to improve. Many of the readers want to live in Germany, Austria or Switzerland. Others are already there and wish to communicate more easily with their neighbours and co-workers. 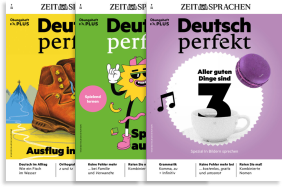 Therefore, it’s not surprising that Deutsch perfekt is among the three most popular newspapers and magazines at Goethe-Institute libraries all over the world, next to the news magazine Der Spiegel and the weekly newspaper Die Zeit. Deutsch perfekt is not only great for learning German from home: The magazine, the audio trainer and the workbook are also perfect for German language courses. Free teacher’s edition “Deutsch perfekt im Unterricht”: Take advantage of the exercises and templates in the magazine supplement based on the texts from that month’s issue. Teachers and instructors receiving the magazine by post will get the teacher’s edition as a printed version. Subscribers to the digital edition (e-paper) will receive the teacher’s edition to download. Do you have any questions? Here you will find answers to the most important questions asked by our readers. Where can I purchase individual issues? 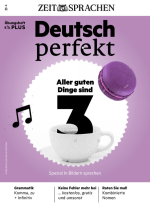 Deutsch perfekt is available at well-equipped magazine and station bookshops. If you can’t find our magazine, go ahead and ask the store clerk! Use My Kiosk to easily find stores in your area in Germany that sell the magazine. 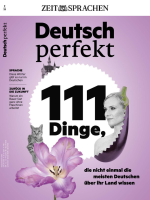 You can also buy Deutsch perfekt at newsstands in many other countries as well as online. Choose your preferred subscription from our subscription shop. This is where you will also find an overview of our prices. The price includes the shipping costs for Germany, and shipping costs are added for all other countries. Is it also possible to subscribe to the magazine outside of Germany? Yes, it’s no problem at all. The euro price includes the shipping costs for Germany, and shipping costs are added for all other countries. Is the digital edition the better choice for me? 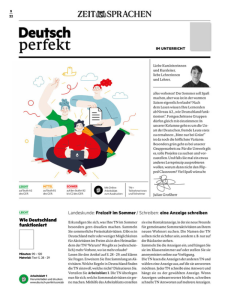 If you live abroad, the e-paper version of Deutsch perfekt might be the right thing for you. As a subscriber you can either stream the magazine on the first day of publication, read the PDF edition or use the free app. You also save on shipping costs. You can pay the e-paper by credit card or as an in-app purchase in the Deutsch perfekt app. Are there special rates for students and pupils? Yes. However, these rates only apply for the printed edition. Special rates are available for students, pupils, community service volunteers, apprentices and student teachers. Please provide relevant documentation (a copy will be sufficient) by email to our reader service, otherwise you will be charged the regular subscription price. Is there a discount for classes and courses (multi-copy orders)? Take advantage of attractive special rates for multi-copy orders. You will find further information in our Spotlight teachers' lounge. Subscribe, give away and more: Who do I ask? Please do not hesitate to contact our customer service – in German or English – regarding any questions about your subscription. If you would like to give away Deutsch perfekt as a gift or if your address has changed: Simply ask our helpful service team! You will find the contact details on our reader service page. You can cancel at any time after the first subscription period – and we will refund your money for issues that have not yet been delivered. Please send your cancellation to our reader service. Important: Gift subscriptions will automatically expire after one year. There is no need to cancel! How can I use the free teacher’s edition? The monthly magazine supplement “Deutsch perfekt im Unterricht” offers ideas for exercises and templates for exciting DaF lessons. The material, which is based on teaching methodology, can be used immediately. It takes up the topics of the current magazine issue and is ideally suited for levels A2 to C1. DaF teachers, instructors and other teachers who subscribe to Deutsch perfekt receive the teacher’s edition for free with the magazine.